A few years ago, I was at a diner having brunch with my family. My aunt offered me her leftover hash browns, and I shrugged. Ok. As she passed the plate over, she gave me a sheepish look. “I only ordered them because I like the crispy crust,” she explained. I looked down at the potatoes. All the crust had definitely been picked off, showing the pasty tubers below. They were pale. There might have been an onion in there somewhere. But they definitely didn’t look or sound good anymore. And I realized my aunt was right. She was the kind of person who was right about pretty much everything, and hash browns were no exception. Serve these hot, with a side of sunny side up eggs and a big glass of freshly squeezed juice. We had them as breakfast-for-dinner. There was some leftover sauce and I had it the next morning, mashed up with a hard-boiled egg before work. I’m pretty sure this sauce would be a perfect sandwich spread, or a pasta sauce, or, even a dip. That means you’d be dipping veggies in more veggies, which is a super healthy way to kick off the weekend. And earns you lots of chocolate. Scrub the potatoes and grate them on the fine side of your grater. Put all the grated potatoes in a flour sack cloth and squeeze as much moisture out of them as you can. Mix the potatoes with the chives and salt. Put the potatoes on a silicone sheet and spread them out really thin. You should be able to cover most of a 12 & 18 pan. It won't spread all the way to the edges. I used a rolling pin. Make some score marks on the potatoes so that you have about 10 even rectangles. Flip the rectangles and bake for about 20-25 more minutes. When you remove the potatoes from the oven, they should be crispy but still a little pliable. Cut each rectangle into 3 pieces. It's easiest if you use scissors. Set potatoes aside. Put the vegetable broth in a sautee pan and bring to a boil. Add the kale and garlic to the pan and let it cook for 2-3 minutes without stirring. Cook, stirring constantly, for 4-5 more minutes, or until it looks as though broth is reduced to 1/4 cup. 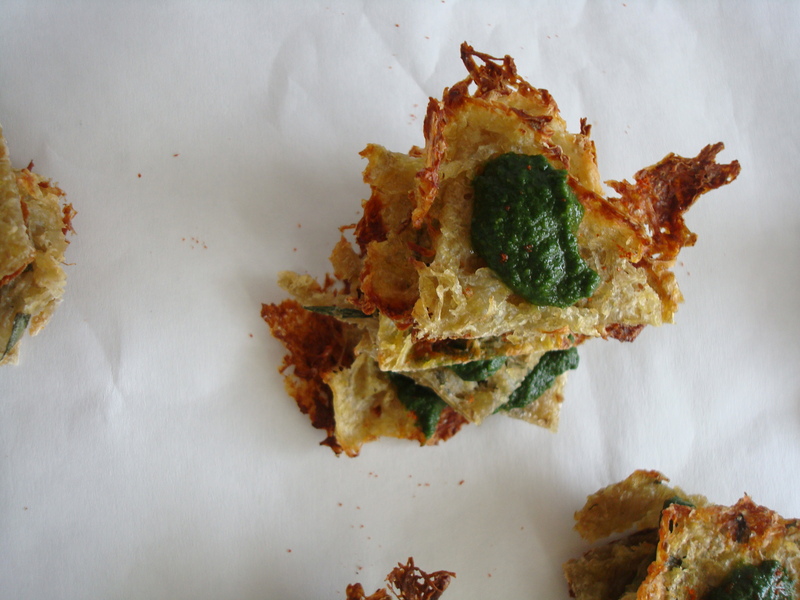 To serve, layer three potato crisps with kale sauce in the middle (potato, kale, potato, kale, potato, kale). 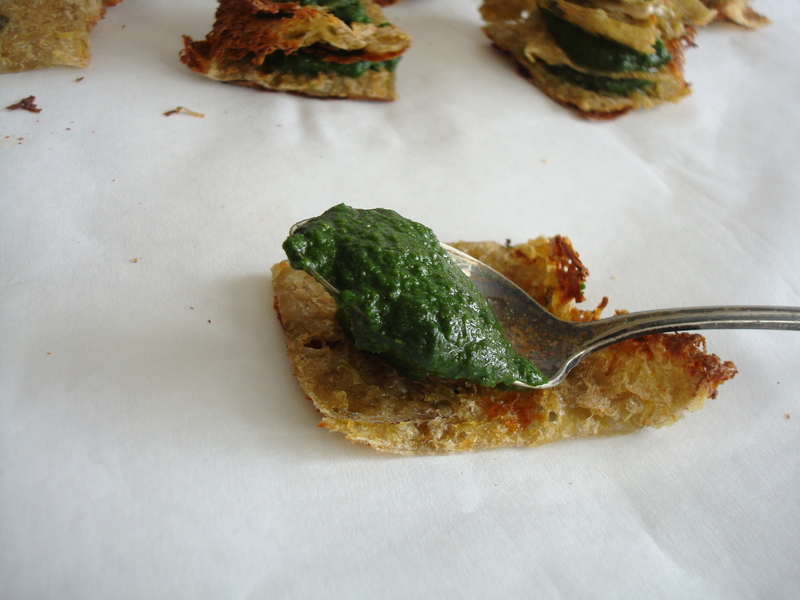 Garnish with crema or sour cream if desired. This is awesome! You’re so right. The crispy crust is where it’s at. And adding kale is always a good thing, right? Love it. Ooooh, that looks like such a delicious snack! Love that you stacked them, too, giving a heftier bite. Thanks for posting! Thanks Nathalie! I only hope to post things that are half as healthy and delicious as you do! Annie, this sounds so awesome! I’m with you–hash brown crusts are the BEST. (And I don’t think you’ve offended anybody who likes the slimy middles, because I don’t think those people exist.) Pinning these to have for a weekend brunch sometime! Thanks for the pin, Elizabeth! I’m flattered! Oh wow, potaotes + kale + chives + curry…sounds almost too good to be true. I have to try this recipe asap! Thanks Mike! We love all your healthy recipes. These are the bomb! 😉 I love that there are no slimy hashbrown middles in these! My kids would love them! Thanks for your comment! It makes me happy to hear that these are family-friendly…sometimes I’m not sure what kids will and won’t eat!